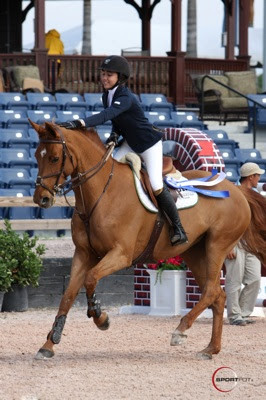 Laura Kraut and Cedric won the $150,000 FEI World Cup™ Grand Prix CSI 3*-W, presented by Spy Coast Farm, during week five of the 2011 FTI Winter Equestrian Festival. Photo © Sportfot, Official Sport Photographer of the FTI Winter Equestrian Festival, www.sportfot.com. 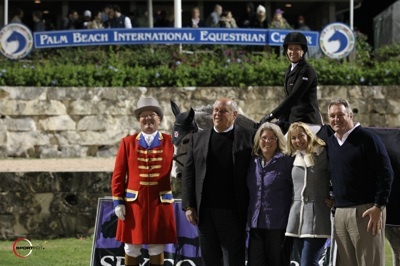 Wellington, FL - February 12, 2011 - An exciting jump-off topped off a fantastic class this evening in the $150,000 FEI World Cup™ Grand Prix CSI 3*-W presented by Spy Coast Farm, as Laura Kraut (USA) and Cedric added another grand prix victory to their tally at the 2011 FTI Winter Equestrian Festival. Following their win in the $78,000 Adequan CSI2* Grand Prix last Sunday, Kraut and Cedric bested an all-star field tonight with a picture perfect round for the win. Alan Wade of Co. Tipperary, Ireland designed the course for tonight's Grand Prix, which saw a crowd 5,600 spectators at the Palm Beach International Equestrian Center. A field of 40 starters showed up to compete and eight of the best were able to jump clear to advance to the jump-off. An impressive list of riders, including seven Olympians, jumped off against the clock in what turned out to be a very competitive class. Canada's Ian Millar went eighteenth in the original order and was the first competitor to jump clear over the first round course riding Star Power, owned by Team Works. The pair then jumped first over the shortened course and laid down a smooth, clear round in 49.11 seconds to kick things off and eventually finish in fifth place. Canadian rider Yann Candele and Pitareusa, owned by Susan Grange, returned next for the jump-off and jumped in top form. The pair was clear in an even 45 seconds to take the lead, but was pushed back to fourth place in the end. Candele's round was followed by Brazil's Rodrigo Pessoa and HH Let's Fly. The duo had an unfortunate two rails to finish with eight faults in 48.01 seconds, earning eighth place honors. The lead changed hands again as Venezuela's Pablo Barrios and G&C Quick Star 11 entered the ring and blazed a clear round in 44.39 seconds. The pair eventually finished in third place. Ready to defend their grand prix title from last week, Laura Kraut (USA) and Cedric entered the ring next and did it again, jumping clear in 43.28 seconds to jump to the top. Three more rounds followed, but Kraut and Cedric held on for the win. Margie Engle (USA) and Indigo, owned by Griese, Garber, Hidden Creek and Gladewinds, were the next pair to jump, but had a rail down to finish with four faults in 45.21 seconds to earn seventh place. Great Britain's Nick Skelton rode Beverly Widdowson's Carlo 273 to four faults in 44.36 seconds to finish in sixth place. The final competitors in the ring were McLain Ward (USA) and Antares F, owned by Grant Road Partners. Fast and clear, the pair put in an exciting round with the crowd cheering them on, but could not quite top the leaders. Their finishing time of 43.46 seconds ended up in second place. Cedric, a 13-year-old Holsteiner gelding by Chambertin x Carolus Z, owned by Happy Hill Farm, has been the ride of a lifetime for Kraut. She praised him after the class, smiling, "I've had a lot of really great horses in my life, but I don't think I'll have another one like him. He's extra special. He's got tremendous heart and the ability to match, which is not often the case. I'm a lucky person to get to have him and I'm going to enjoy every minute of it." McLain Ward said with a smile, "When Laura went clear tonight, I was thinking, 'Man Cedric's going to be a pain in the neck for the next few years!' I could see him at 17 still clocking around like that." Commenting on the jump-off Kraut stated, "It was luck. You couldn't really do anything different in the jump-off; you just had to go as fast as you could on the long stretches and turn as tight as you could to the big, big verticals and walls. I'm pretty positive that that's as fast as I can go. I don't know where I could have gone faster. It was one of those jump-offs where everything just came up perfectly." She continued, "I tried to stay inside the hoof prints on the turn, and hopefully I would be a little bit up on them. My horse is notorious for jumping walls strangely. I saw where the hoof prints were turning to the wall and it terrified me. The distance came up. He can also exit out and choose not to jump, but he was very good and jumped right over it." Continuing about the course, Kraut noted, "I thought it was a brilliant course. I was a little nervous watching the beginning of the class. There were not many clear rounds, but the second half came on and more seasoned horses and riders went. They did not make it look easy, but they jumped around it nicely, so I felt a little bit better." Second place finisher McLain Ward praised Alan Wade on his course tonight and stated, "I think he's an incredible course designer. We saw him the first time four years ago at Devon and a few times since then. In my opinion he is one of the best in the world. It was a smart course. He builds rider's courses. They're big and they're hard, but they make sense. You understand why if you have a rail down. I thought it was a challenge for any type horse. It was very well balanced and a strong enough test without being a massacre. That's always a fine line in World Cup classes." Commenting on his round, Ward explained, "I saw Pablo go on the screen and when I saw him do the same numbers as I could do, I knew I was in trouble. If the quicker horses can do the same numbers as my big-strided horse, that's a concern. He's fast, but I can leave out strides and there really wasn't an opportunity to do that. Rolling back at the vertical by the in-gate I kind of second guessed it and got in a tug of war. I think I lost quite a bit of time there and it was my mistake. 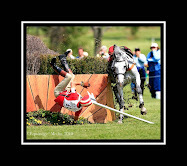 I should have trusted my horse a bit more." Third place finisher Pablo Barrios also discussed the class, saying, "There were eight very, very nice combinations in the jump-off. When I went, I knew who I had behind me, and as McLain said, I tried to do the least strides possible because I know he has a big horse. I had a little trouble because there were two rollbacks and it's not easy with the hackamore that I'm using. I almost missed the wall and I had to add one for the double combination. I think I lost a little time there, but they're always going to try to beat my time. If they leave the rails up, they're going to be the winners. I feel very confident with this mare and when I walk any course, I feel good for her." Earlier in the day the junior and amateur-owner jumpers showed in the International Arena. 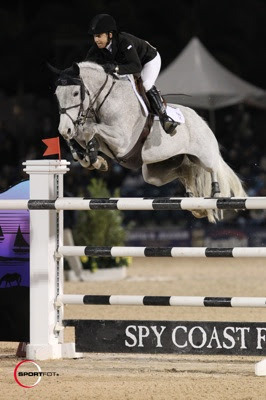 Making it four weeks in a row, Christina Kelly won the $10,000 EquiFit High Junior Jumper Classic, this time riding Creata Van Ten Biesen, owned by Diamond Edge Farm. Kelly also won a class in the Medium Junior Jumpers earlier in the morning. The $15,000 ECB Equine Spa High A/O Jumper Classic was also held today with a win for Whiskey and owner/rider Sophie Coppedge. 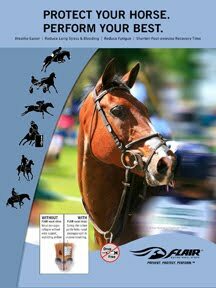 The FTI Winter Equestrian Festival will conclude its fifth week of competition on Sunday with the $15,000 Artisan Farms Young Rider Grand Prix at 9 a.m. and the continuation of the $25,000 Suncast 1.50m Championship Jumper Classic Series in the afternoon.